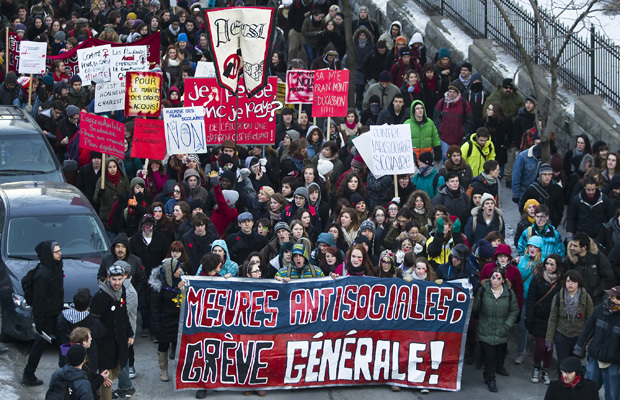 Largely unreported in the global media 170,000 students in Quebec (more than a third of the total) have now been on strike for three months. It has lasted so long that some journalists have taken to likening it to the movements in the Arab world and dubbed it “the Maple Spring”. The students in universities and GECEPS (colleges) are fighting to prevent a 75% hike in tuition fees over the next five years. It will come as no surprise to anyone that this is part of an austerity package of budget cuts announced by the Liberal Government of the province to “bring down the deficit” from $3.8 billion to $1.5 billion in a single year. On this level it has a familiar sound. On April 20, students demonstrated outside a job fair for Quebec’s Plan Nord — a major initiative to develop the province’s north — where Mr. Charest was speaking. One demonstrator was pepper sprayed in the face as he tried to enter the Palais des Congres. In his speech that day, Mr. Charest mocked the protesters and offered to give them jobs in the province’s north (3). Little wonder that two days later a quarter of a million demonstrated in Montreal on Earth Day. Many of the demonstrators pinned the small red squares which denotes the student movement to their clothes in solidarity with the strike. No wonder the Government would not negotiate and has poured vitriol on the students. It has tried to portray them as selfish spoiled brats who want everything for free. This flies in the face of the fact that they were not fighting for themselves but for the rights of those who would follow them. No wonder this Government rhetoric has incited its paid thugs (aka the police) to use unprecedented violence on peaceful demonstrators – a violence which makes anything seen so far in the “advanced democracies” look rather tame. No wonder it has cited the antics of a few who have responded with violence to condemn the whole movement when the real violence has been that of the state. In the face of this the tenacity of the students has been admirable. Militant and resolved though the students have been they cannot win this fight alone. Some them know this, and have made attempts to reach out to rest of the society and, in particular, to the wider working class. They have not done enough of this but they have also come up against the hypocrisy of the unions. The unions have supported the strike verbally (how often do they do that with workers?) but have not once organised a single day of solidarity action with the students. This is because they are in reality part of the corporate management of the state. In recent years they have signed hundreds of deals to ensure the profitability of Quebecois capitalism which has led to lay-offs, speed-ups and wage freezes for workers. And this weekend the union leaders were the ones who “brokered the deal”, as one of our comrades put it, to get the student leaders into signing away the principal aims of the fight. When it comes to negotiating a defeat behind closed doors no-one can compete with the union leadership. The deal that was finally stitched up was nothing less than a complete climbdown for the students. The fees will rise but over seven years rather than five and the way is open for further fees rises in the future. A committee is to be set up to look at further savings from university budgets which might then reduce administrative fees students have to pay. But as its composition is dominated by business and government this is unlikely to find any and the Government has already said it is unlikely to make savings. Not surprisingly the leaders of the three student organisations have held this last clause out as a sop to the movement to hide their sell-out. It is equally unsurprising that they have not been able to sell the deal to their members. The stakes are indeed high. Global capitalism in crisis cannot renege on its need to make us all pay for its plight. By resisting its attempts to turn back the clock the Quebec students are implicitly posing an entirely different mode of social organisation. If capitalism can only offer more misery, more debt and worsening conditions of existence it is time to explicitly reject it. But the students can only pose the question. The answer can only be given by the working class as a whole. The movement has to widen to become a full-scale anti-austerity movement which takes in the fears and aspirations of the majority of society. This is not going to come about any time soon but the anger and rage of this movement has to be built on. What is needed is an organisation which recognises explicitly that capitalism offers no future. We need to abolish the society that puts profits before people, that needs money for its functioning and its state to repress all opposition. It is time for a communist programme. (1) And opinion polls suggest that he and his Liberal Party cronies will be thrown out at the next election this year (as happened after the last big student revolt in 1990). A minor correction: there are no GECEPS in Quebec (nor elsewhere); you were probably talking og cégeps (=collèges d'enseignement général et professionnel). Anyhow, this is a nice article. I'm trying to translate it.